You are here: Home / Signature Services / See The Difference! An average hotel room averages about 400 sq. ft. Our 1 bedroom apartments start at 700 sq. ft! We also offer 2 and 3 bedroom apartments from 1000 sq. ft. up to 1500 sq. ft., or more. 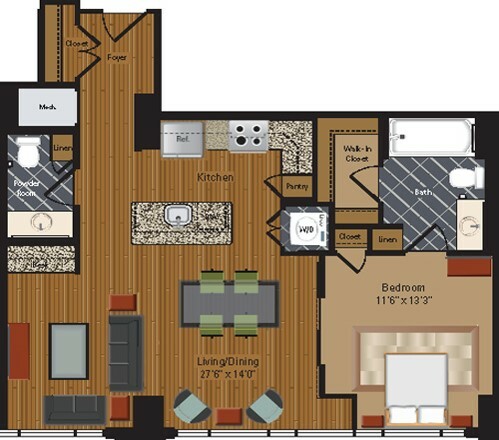 See the difference between an average hotel room and one of our 1 bedroom layouts below! Suite Solutions’ ONE(1) BEDROOM APARTMENT: starting at 700 sq. ft.
AVERAGE HOTEL: 400 sq. ft.